Our combined ground/aerial census took place from 16-20 March 2015. 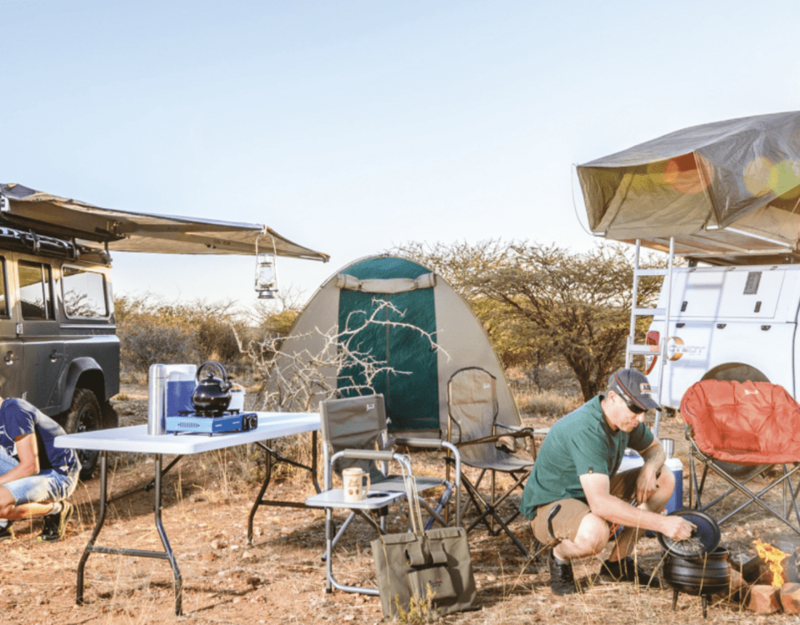 The team consisted of Wilferd Versfeld, Holger Kolberg, Hanjo Böhme, Seth Guim, Ute von Ludwiger, our pilot Dr Nad Brain and Mike and Ann Scott. Only three nests were produced this season, namely at Charitsaub, Salvadora and Halali Seepage. Only one chick resulted, from the faithful Charitsaub pair. The other two nests failed and both re-laid (2 eggs) that also failed. 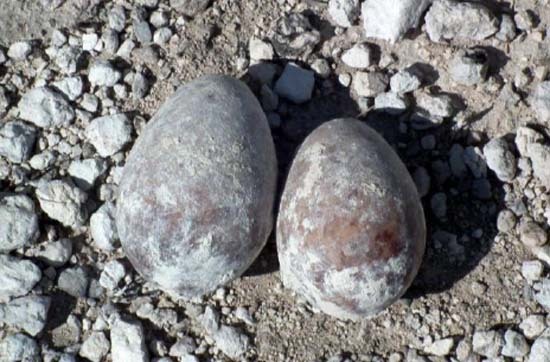 Interestingly, this is our first record of second clutches in Namibia (with only four other second clutches on record in Roberts VII). It is speculated that the low breeding success this year is related to the relatively dry summer. We counted a total of 17 adults + 1 chick. The chick was still too small to ring, but hopefully this will take place before it fledges. 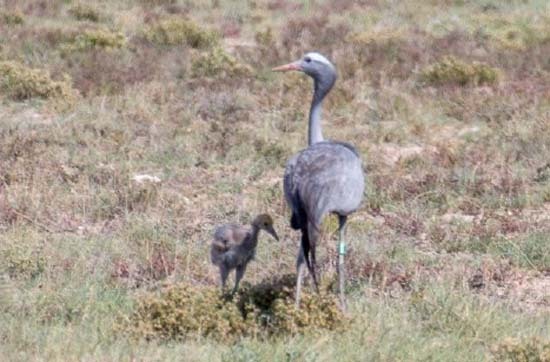 The long flight on 19 March 2015 yielded only 2 Blue Cranes + 1 Wattled Crane at Andoni (18 30.83S 16 45.09E) and 3 Wattled Cranes at Oponono (18 20.92S 15 54.31E). The Lake Oponono area was extremely dry, with people and cattle at practically every source of water.We saw large groups of pelicans some distance from the water; and two vulture groups (an unusual sighting here). 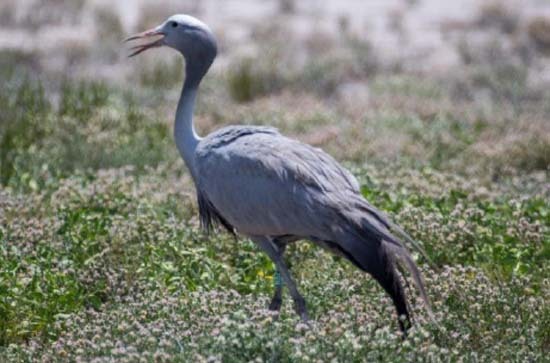 At present the causes for the decline of Blue Cranes in Namibia are still speculation, but believed to be a combination of factors ranging from increased competition and loss of habitat; illegal hunting outside Etosha; and the possible effects of environmental changes. Many thanks to our dedicated team for this ongoing effort! Special thanks to the Ministry of Environment & Tourism for logistical support, and to our pilot Nad Brain for the delicious campfire meals. The generous sponsorship of this combined survey by the Environmental Investment Fund of Namibia for the third consecutive year is acknowledged with sincere appreciation. We would also like to thank all our other donors for their ongoing contributions, in particular Mathias Stein and Barbara Hudec and the Hessische Gesellschaft für Ornithologie und Naturschutz e.V. (HGON) in Germany. 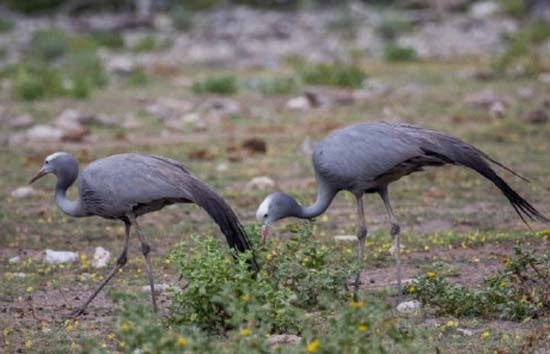 Promoting awareness amongst local communities about the plight of the Blue Crane has been targetted as a priority in our action plan, in view of the continued decline in numbers. The Blue Crane is the subject of a striking display, produced by graphic artist & designer Saar Maritz of “saardesign”, as part of a new awareness facility at Okaukuejo. Our taxidermy specimen (funded by the HGON & Partners) forms a focus for the display. 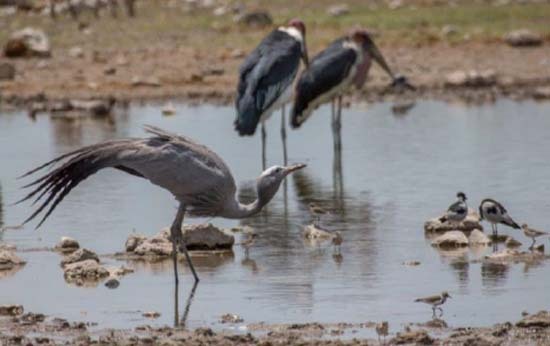 The Namutoni Environmental Education Centre (NEEC) has come to the fore with strong support for reaching these communities to the north of the Etosha Park who can influence the cranes when they visit these areas in winter. Young learners of all ages are the main target group for spreading the message. Our popular crane activity book, which Kasha Ostbloom illustrated and helped us produce in 2005, has been reprinted. Two thousand copies (in English/Oshiwambo) have been provided to the NEEC to use as a basis for crane educational activities. The sponsorship of the Environmental Investment Fund of Namibia for the printing is acknowledged with gratitude. An article has also been produced for the journal of NEWS, Roan News. 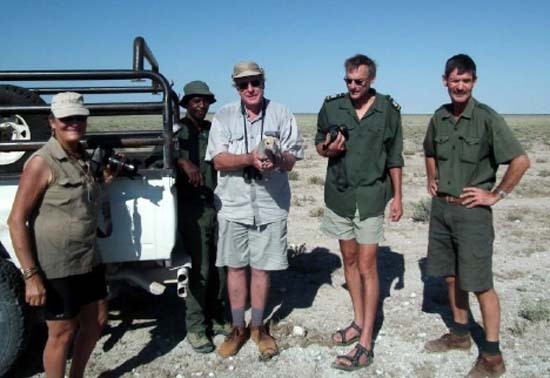 Recently the Namibia Bird Club made a generous donation of binoculars and a bird guidebook to Vilho Absalom, an Environmental Educator at the centre, for use in the above educational activities. Many thanks, Gudrun Middendorff and Hanjo Böhme, for arranging these useful gifts! Absalom and his groups can now hopefully spot all the Blue Cranes in their vicinity and provide regular reports. Other wetland birds will be included in these conservation activities. 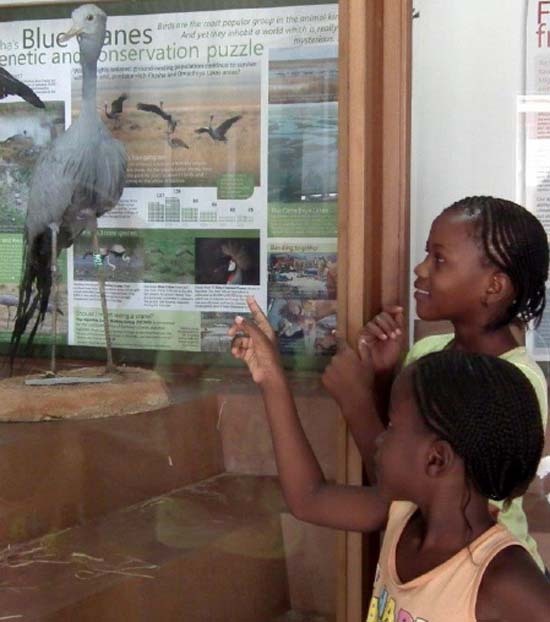 Namutoni Environmental Education Centre has included in their Primary School programme the Blue Crane activities.